In June 2008 I began building Gaia's Dream in Urunga, NSW, Australia. This boat is the fourth I have built for myself. 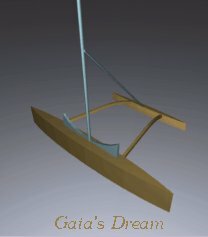 I like living on the water and experiencing the world, so I built the proa Gaia 1 in 1990 and one year later the proa Gaia 2. 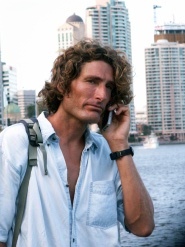 I then sailed to Australia with Gaia 2. In 1996 I began building the mono hull Love of Gaia as Gaia 2 was too small to house a family. This boat has been a good boat and home for me and my son and sailing mate Joshua (born 1999). Gaia's Dream is a very fast boat, which is as environmentally friendly and sustainable as possible. She can sleep 12 people, or sleep 8 people and carry 7 tons of cargo. To achieve this, Gaia's Dream is built from sustainable timber and other materials, is fossil fuel free and a proa. The Gaia's Dream venture will focus on environmental and social projects anywhere in the world. A few people with the right attitude can make a big difference in this world. It’s an old saying but still true: “For evil to prevail all good people have to do is nothing”. In Gaia's Dream we have a tool with which to enhance and preserve life anywhere on the planet.